Of all the executive sedan makers selling their wares in the United States, none are as peculiar as Infiniti. Whereas the likes of Lexus and Acura have managed to gain some form of a foothold in a market that’s long been dominated by European brands, Infiniti’s often found itself trailing behind its contemporaries. It says a lot about a brand’s popularity when BMW can sell more cars in America per year than Infiniti can across the entire world. To the company’s credit, though, Infiniti has been making huge strides in recent years, and perhaps the firm’s best all-rounder is its replacement for the G37 sedan: the Infiniti Q50. It’s a wildly different car to the ones that preceded it, and there’s no denying the Q50 is a massive improvement over the car that precedes it. But are those upgrades enough to make this Infiniti a genuine threat to Audi and Mercedes-Benz? Built in Japan. Sold in the States. Clearly inspired by the Europeans. Infiniti sells its wares in almost every market you can think of, including the fiercely-demanding European market. For ages, the only territory that Infiniti operated in was the United States. As a result, it’s no surprise that a lot of the company’s cars were rather well suited to life on America’s myriad highways and residential areas. However, things are a lot different now: Infiniti sells its wares in almost every market you can think of, including the fiercely-demanding European market. So, as it’s not really feasible to make two versions of the same car for different customer demands, the end result is an Infiniti Q50 that feels heavily inspired by the executive sedans on the other side of the pond. Take the exterior styling as a prime example. Compared with the curvy and fairly simple proportions of the G37 sedan, the Infiniti Q50 has a far more muscular and aggressive shape, with sharp bodywork creases and angular detailing giving the car a far more imposing identity to Infinitis of old. From certain angles if you squint a bit, the Q50 can even be mistaken for a Maserati Ghibli – which, for clarification, is a huge compliment in our books. Inside, the Infiniti Q50 has also been given a thorough makeover in order to distance itself from its predecessors. Only here, however, the car doesn’t fare as well: yes, it’s a much nicer place to spend longer journeys in when compared with older Infinitis, and we especially love the dual-screen multimedia interface on the center console, but there are a few too many cheap plastics and trim pieces taken from lowly Nissan models for our liking. Remember, the Q50 is an executive sedan with a starting sticker price of $33,950. Things do improve a bit when we look at the practicality side of things. As Infiniti has positioned the Q50 between the two executive sedan classes size-wise (for reference, the 200 meters longer and shorter than a BMW 3 Series and 5 Series respectively), the car is that bit more accommodating than many of its rivals. That said, it’s not by a huge margin: whilst space up front is fine, with plenty of adjustment in the seat and steering wheel, the back seats are hemmed in a bit for overall headroom. Leg room is also severely compromised for whoever pulls the short straw and gets stuck in the middle rear seat, thanks to the rather broad transmission tunnel – though it’s worth pointing out that all of the Q50’s rivals suffer from this quirk, and leg room for the other two passengers is pretty good. In summary, then, the Infiniti Q50 Hybrid doesn’t really impress with its load lugging capabilities! Only when we get to storage capacity do we find any real drawbacks to the Infiniti Q50 with regards to practicality. Cubby holes are pretty sparse throughout (there aren’t any pockets in the rear doors, for instance), and those that are retained are on the small side. Trunk space suffers on the Infiniti when compared with rivals cars, too: though the outright capacity of 13.3 cubic feet does put it on par with a Mercedes-Benz C-Class on paper, the actual story is that it’s a really awkward shape that’s further compounded by the narrow opening – meaning you’ll only just get a decent-sized suitcase in the back. Worse, due to the packaging requirements of the battery packs under the floor, the Q50 Hybrid’s trunk only has a mere, city car-esque capacity of 9.3 cubic feet. Those same battery packs also mean the Hybrid can’t come with the 60:40 split-folding rear seat arrangement, so you’ll have to pack lightly if you’ll be regularly using all of the car’s five seats. In summary, then, the Infiniti Q50 Hybrid doesn’t really impress with its load lugging capabilities! The Infiniti Q50 doesn’t travel down the road with much verve or dynamism at all. Given the Infiniti Q50 is aimed squarely at the established executive sedan class leaders and engineered to be that but more dynamic than the fun-but-flawed G37, you’d expect the car to be pretty pleasant to drive. The fact Infiniti’s also using the Q50 as a starting base for its svelte Q60 coupe further reinforces the assumption that the sedan will be a credible threat to the likes of the Jaguar XE in terms of ride and handling. Unfortunately, though, that’s not quite the case. No matter what wheel sizes, sports suspension kits or driving mode options you throw at the car, the Infiniti Q50 doesn’t travel down the road with much verve or dynamism at all. Sure, it’s not terrible to drive, but you’ll struggle to find any variant that drives with the aplomb of its mainly European competitors. Most of this lost ground is a result of the steering, which feels incredibly numb, vague and lifeless in comparison with the more immediately intuitive systems in cars like the Cadillac ATS, along with making this Infiniti one of the more troublesome cars to place accurately on the road – especially twister sections of asphalt, where you’ll find yourself constantly making small corrections to the steering at less-than-brisk speeds. At least it isn’t as bad as the steer-by-wire ‘Direct Adaptive Steering’ setup, which turns the already dynamically blasé Infiniti Q50 into a downright bizarre car to drive. Since there isn’t a mechanical link from the steering wheel to the front wheels on models fitted with this feature, you get even less feedback, to the point where it’s quite difficult at times to properly judge exactly what the front wheels are doing, and precisely ascertain which direction the front wheels are pointing. Mercifully, Infiniti offers the Direct Adaptive Steering system as an optional extra you can handily ignore on almost every Q50 model (only the Hybrid model gets the steer-by-wire setup as standard). It’s a shame that the steering drags the whole driving experience down, as the rest of the Infiniti Q50 actually holds up rather well. For instance, the car is incredibly well suited to long distance journeys: get it up to a cruising speed on interstate highways, and the finely judged suspension setup will soak all but the fiercest of pothole-riddled road surfaces you can chuck at it. Furthermore, refinement levels are very good, thanks to the impressive amount of sound proofing, and are enhanced even further on the Hybrid model by the speaker-based noise cancelling system that’s not too dissimilar from the systems you find in high-end headphones. When all brought together, the Infiniti Q50 no longer comes across as an executive sports sedan in the same mould as a BMW 3 Series – instead, it’s far better suited to life flowing along the open road in impressive-by-class-standards comfort and serenity; sweeping away for the most part those irksome steering issues under the proverbial carpet. Of all the engines you can slot under the Infiniti Q50’s hood, it’s the 2.0-liter one that we reckon will be beneficial to most buyers. When it was originally launched, the Infiniti Q50 only came with one engine option: a 3.7-liter V6 gasoline engine that wasn’t too dissimilar to the identically-sized engine available in the 370Z sports car. Though it was undoubtedly a good engine, a big, thirsty V6 doesn’t appeal with everyone who buys an executive sedan nowadays – and it didn’t help that the motor itself didn’t feel as smooth or as responsive as its equivalents in rival cars, either. It’s a good thing, then, that Infiniti has since then comprehensively updated the engine line-up in the Q50 range. That big V6 is now no more, for a start, with a pair of twin-turbocharged 3.0-liter V6s (one with 300hp, the other with 400hp) filling in that void. Likewise, to lure punters away from the default-buy BMW 320i and Audi A4 2.0 TFSI, a 2.0-liter turbocharged four-cylinder gas engine kicks off proceedings in the Q50 range, and there’s that Hybrid model we mentioned earlier sitting just below the V6s in the Infiniti Q50 pecking order. Of all the engines you can slot under the Infiniti Q50’s hood, it’s the 2.0-liter one that we reckon will be beneficial to most buyers. For sure, it’s a long shot from being fast (it only has 208hp, after all), but you do get a decent slug of torque from 1,500rpm to 3,500rpm, so there’s ample pulling power from low down in the rev range. It also helps that the engine is silky smooth and only starts to sound coarse when you really rag it hard towards the 6,500rpm redline. Plus, with claimed economy figures 23/31mpg for the city and highway respectively for the rear-wheel drive models (or 22/28 for Q50 2.0t variants that comes with the optional all-wheel drive system), the Infiniti is fairly frugal – though it’s worth pointing out that the like-for-like BMW 3 Series, Mercedes-Benz C-Class and Audi A4 are, on paper at least, able to go that bit further per gallon of fuel. No matter which engine option you do go for, you’ll only have one transmission – a seven-speed automatic – to choose from. 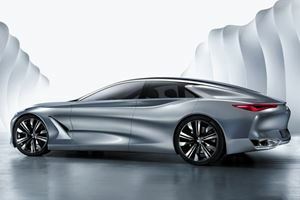 For the more speed-focused drivers among us, the twin-turbocharged V6s will be a mighty fine motor to choose from (especially as Infiniti won’t be putting its ‘Nissan GT-R sedan in all but name’ Q50 Eau Rouge concept into production). No matter which power output you go for, you’ll get a quick car: even the slowest models can reach 60mph from a standstill in 5.5 seconds, with the all-wheel drive 400hp versions shaving another second off that time. Plus, they sound great, have lots of torque on offer between 1,600rpm and 5,200rpm (295lb/ft of the stuff for the 300hp engine; 350lb/ft for the 400hp V6) and are reasonably frugal for such powerful engines (Infiniti claims between 18mpg for the city and 29mpg on the highway is possible, depending on what engine you go for and whether you opt for the all-wheel drive system). If there’s one powertrain we’d advise you steer clear of, it’s the gasoline-electric hybrid setup. To Infiniti’s credit, it’s not because the system is pants – on the contrary, it’s actually a really impressive system that blends the pace of the V6 models with running costs that’ll make owners of the Q50 2.0t green with envy. What really holds the car back is the price: at $47,050 , it’s not only a few hundred bucks away from the 300hp V6 model’s sticker price, but is also $1,500 more than the Mercedes-Benz C-Class ‘C350e’ plug-in hybrid and a staggering $13,000 more than the base Infiniti Q50 2.0t. Factor in those practicality issues we discussed earlier, and you’re left with a car that, despite its technical accomplishments, is a really hard sedan to recommend to most Infiniti Q50 buyers. No matter which engine option you do go for, you’ll only have one transmission – a seven-speed automatic – to choose from. In many ways, it’s a pretty good gearbox that suits the car’s more relaxed, cruiser-centric character, especially when left in its fully automatic setting. However, put it in full-on ‘Manual’ mode by using the paddle shifters mounted on the steering column, and you’ll find the gear changes aren’t the crispest you’ll find in this class (especially if you’re already used to the slick automatic and manual shifts in a Volkswagen or Audi double-clutch gearbox), and can marginally undermine the more sporting character of the V6-powered Infiniti Q50s. In quite a few ways, the Infiniti Q50 does prove itself to be a more affordable and cost-friendly alternative to its pricier counterparts. For starters, several of its rivals are more expensive to buy than the Infiniti Q50 (even if for some competitors, such as the Jaguar XE and Cadillac ATS, it’s not by that much), and Infiniti has crammed a fair bit of kit into the Q50. Also, regardless of which model you go for, you’ll be greeted by a dual multimedia display interface (with the bottom screen doubling as a slick and intuitive touchscreen), climate control, electronically-adjustable front seats cruise control and a rear parking camera, with the latter helping to alleviate the less-than-stellar rear visibility. Safety kit is pretty high on the agenda, too, with every Infiniti Q50 model being fitted with tire pressure monitoring systems, six airbags and even a hood that ‘pops up’ slightly if the car detects a head-on collision with a pedestrian. It’s no wonder, then, that the Infiniti Q50 scored the maximum five stars in its NHTSA crash test. That being said, there are some ways in which the Infiniti Q50 does cut a few corners when it comes to standard equipment. Leather upholstery, parking sensors and the blind spot warning system are only standard on the Hybrid model, and can’t be fitted at all to the most basic Q50 models with the 2.0-liter gasoline engine. The Hybrid and the lowly 2.0-liter unit are also denied access to really basic features like split-folding rear seats – if the upcoming QX30 can get them as standard, why can’t the pricier Q50 executive sedan? It also doesn’t help matters when Infiniti cordons off a lot of its optional extras into package bundles. Fancy some heated front seats on your Infiniti Q50? You’ll need to buy the $2,250 Premium Plus Package, then? Want to individually specify the lane departure warning system? Sorry, but the only way to get it is through purchasing the $1,850 Technology Package. Whilst extortionate options lists aren’t anything new in the executive sedan class (have you how pricey a BMW 3 Series can get when you throw everything at it!? 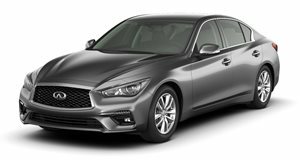 ), it is a shame how the Q50’s relatively competitive asking price is countered by Infiniti’s steadfast refusal to let buyers pick and choose which extras they want to add to their cars. 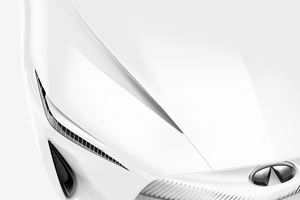 Back when the Infiniti Q50 was unveiled, we had high hopes that this would be the car that finally put Infiniti in the big league; the most important shake-up to the executive sedan market place from a Japanese car company since the Lexus LS400 amazed us all over twenty years ago. Instead, however, we got a sedan that, in quite a few areas, struggles to compete with its more accomplished peers. That’s not to say the Infiniti Q50 is a bad car, though. In many ways, the Q50 impresses us greatly – and in more than just a ‘wow, this is such an improvement on the G37’ way. When it comes to comfort and refinement, in fact, the Infiniti can show up quite a few of the top cars in this class. It’s just a shame that the rest of the car can’t match those same high standards. As we said earlier, there’s plenty to like about the Infiniti Q50, and we’re sure that whoever does go for it in the end will be highly satisfied with their purchase. Given how competitive the executive sedan marketplace is right now, however, we simply can’t recommend you opt for an Infiniti Q50 when there are so many well-rounded rivals to choose from right now. Could this be a Tesla Model 3 fighter? 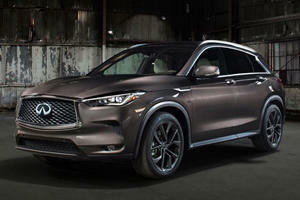 Infiniti's new QX50 crossover features the world's first combustion engine with variable compression.